We get quite a few suggestions for EOTD honors and we try to get to all of them, but a tip from a Fiat X1/9 racer always gets jumped to the front of the line! Bernice, of the Italian Stallions 24 Hours Of LeMons team (that's her on the left, replacing a head gasket on a Fiat SOHC in the bracing 36° air at Arse Freeze-A-Palooza '08), wants us to know "This FIAT engine often ignored in the US due to its small displacement, regardless it is IMO one of FIAT's best engines from the 1960's. While the FIAT twin cam gets much of the glory and noted attention, this is actually the better of the two in some ways. Designed by Aurelio Lampredi, famed Ferrari engine designer before he went to work for FIAT. He is also the one who designed the FIAT twin cam from this era. Production of this engine ran from 1969 to 2005. By the mid-1980's FIAT produced over 6 million copies with numerous variants." 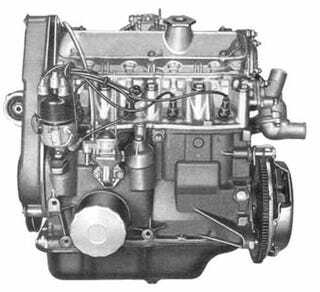 Originally designed to power the Fiat 128 (which, as we know, Enzo Ferrari chose to use as his daily driver) the Fiat SOHC had a good long run, from 1969 to 1999. In addition to 128s and X1/9s, a version of this engine was used in that Balkan legend, the Yugo (including turbocharged examples). The Ritmo/Strada, Punto, and 127 also had Fiat SOHC power, and a number of Lancia machines were fitted with this iron-block/aluminum-head workhorse as well.